It’s time for everyone’s favorite bookish dating game, Elite Bookish Singles. Take a look at the single’s ad below and make a guess at who it is in the comments. 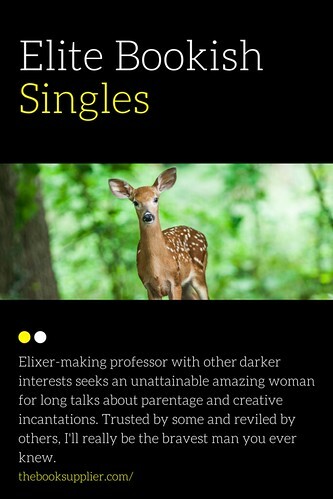 Elixir-making professor with other darker interests seeks an unattainable amazing woman for long talks about parentage and creative incantations. Trusted by some and reviled by others, I’ll really be the bravest man you ever knew.